Clydesdale Western’s fate of becoming champions of Women’s National Division One is back in their hands after favourable results elsewhere followed their weekend wins over Watsonians and Grange EL. 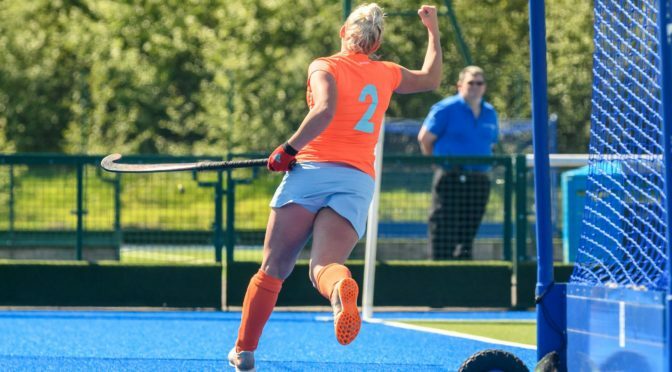 On Saturday, ‘Dale Western took three points in their home clash against Watsonians thanks to a hat-trick from Heather Lang, taking her tally for the season to 23 goals. Jen Eadie and Emma McGregor were the other scorers on Saturday, but it was Sunday that has proven to be pivotal in the L1s favour. A 7-0 win away to Grange EL at Fettes College – with a goal each from Lang and McGregor as well Lexi Sabatelli, Frances Lonergan, Bronwyn Shields and two from Millie Brown – saw Clydesdale Western take top spot in WNL 1. The hold on top spot remained at the end of the day after fellow challengers Edinburgh University and Dundee Wanderers played out a 2-2 draw in a late Sunday passback at Peffermill. It means ‘Dale Western are level on points with Uni, but are ahead of them in WNL 1 as they hold a goal difference advantage of six. The L1s will play Dundee Wanderers on the final day of the season, before Edinburgh Uni play away to Hillhead. Despite a win against Watsonians, Clydesdale Men’s 1s hopes of reaching a top four spot in Men’s National Division One are virtually over after defeat on Sunday to Grange – who were confirmed as champions again prior to the two sides meeting. On Saturday at Peffermill against Watsonians, the contest came to life after a goalless first half. The game did hinge on a red card issued to a Watsonians player, as well as a captain’s card for the home side’s goalkeeper, but also saw a virtuoso display produced by ‘Dale forward Struan Walker. Walker scored a stunning first time volley before Watsonians equalised. A further two penalty corners and a simple open goal tap in from Walker. The Scotland U18 internationalist also set up another after his pass into the circle was converted by Aidan Black via a sliding deflection. Ben Galloway scored his first ever goal for the M1s with a thumping finish to end the scoring at 6-1. But wins for Uddingston and Edinburgh University later in the day dented Clydesdale’s chances of a top four finish and a 3-0 loss on Sunday at Fettes College to Grange – who were crowned champions 24 hours before the two sides met – has now all but surely ended the M1s chances for another season. Despite keeping themselves in the contest during the first half, ‘Dale were grateful for the crucial saves from goalkeeper Sean Mahoney. Mahoney was eventually beaten, however, from a short corner minutes before half time. Grange pulled further away by adding two more goals to their tally and take all three points. Clydesdale are still mathematically in the hunt for finishing fourth in MNL 1, but would need an extremely improbable set of results on the final weekend of the season to go their way. The M1s finish the league campaign on Saturday with a home game against Gordonians. Clydesdale Western’s teams had a relatively successful weekend, whilst the Clydesdale Men’s sides suffered brutal defeats. The M2s lost 6-3 away to Inverleith 2s in Men’s Regional Division One, courtesy of a disastrous first half that left the M2s 3-0 down. And despite second half goals from Colin Moulson, Jeetinder Berman and Martin Eichhorn, the home side clinched all three points with another three goals in the same period. Ali Bleach registered the M3s only goal in a 6-1 defeat to Hillhead 3s at Old Anniesland, whilst the M5s lost 9-0 to Oban 1s, despite another encouraging set of performances from the club’s youngsters. For the ‘Dale Western teams, there were big wins for both L2s and L3s in Women’s Championship Division One. Lucy Arnold scored four in an 8-1 for the L2s away to Stirling University 1s – Rhona McGregor with two, Hannah MacDonald and Ruth Moffett were the other scorers. Gill Green and Rachel Whittle both scored a brace, whilst Ali Cox and Helen McNaught got a goal each in the L3s 6-1 win at home to Grove Menzieshill 2s. The L4s and L6s lost their respective games away to Troon’s 1s and 2s. Anna Winter and Emma Murray were on target for the L4s 5-2 loss to Troon 1s, whilst the L6s lost 2-0 to Troon 2s. The L5s picked up three points in their contest against Uddingston 2s. Goals from Kirstin Stobo and Annie Lonergan gave the L5s a hard fought 2-1 win.